Every once and a while you get the chance to participate in something that is bigger than yourself, and you do not full realized the significance until you are fully immersed in the project. 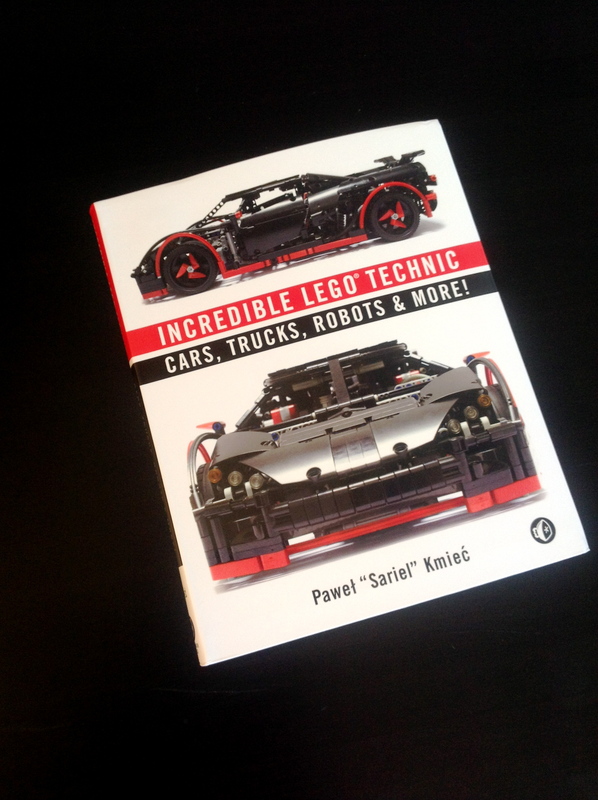 Pawel “Sariel” Kmiec is well known in the LEGO Technic Community, so I was surprised when he sent me an email last February. 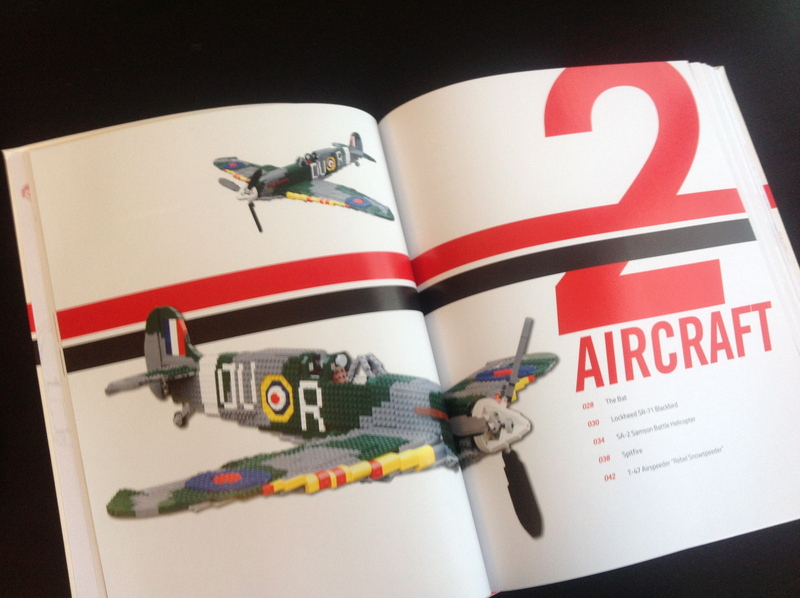 He was putting together a book of various Technic MOCs, and he wanted to know if I would be interested in having my Spitfire included in the publication. Absolutely. After emails, photos, photoshop, drafts, and other small tasks, I was part of the project. After months, I have finally received a copy of the book. 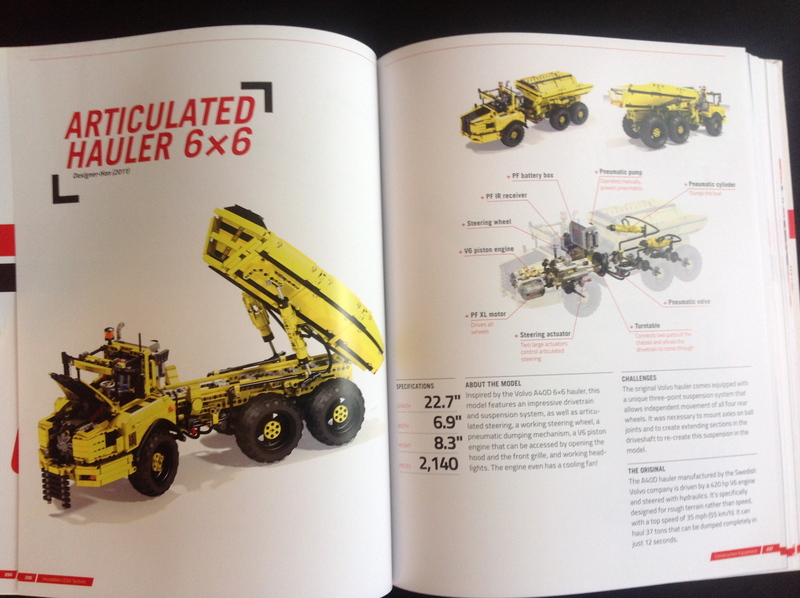 Incredible LEGO Technic: Cars, Trucks, Robots & More is published by No Starch Press (San Francisco, CA, USA, 2015) and will be one sale in the coming days. Sariel is the author, and Eric “Blakbird” Albrecht is the Technical Advisor. After a great forward by Conchas, and a heartfelt introduction by Sariel, the book dives right into the MOCs. Starting with Agricultural Equipment, it is organized into chapters to group the MOCs in like categories; airplanes, cars, supercars, trucks, things with tracks, and others. For this content the organization works well. For the most part, builders only have a single MOC presented, so having it organized by builder is not necessary. With each passing chapter, we are given about four pages for each MOC, complete with a short writeup, and listing of features. Each MOC has about 6-10 high quality pictures devoted to it, and some have great renders of their functions. While many of the models I know well, the renders are a helpful tool for persons who are new to Technic or to the MOCs. Understanding the complexity and mechanics of each MOC only increases your awe for the builds. Each MOC lists the builder (by screen name), and the year the build was completed. 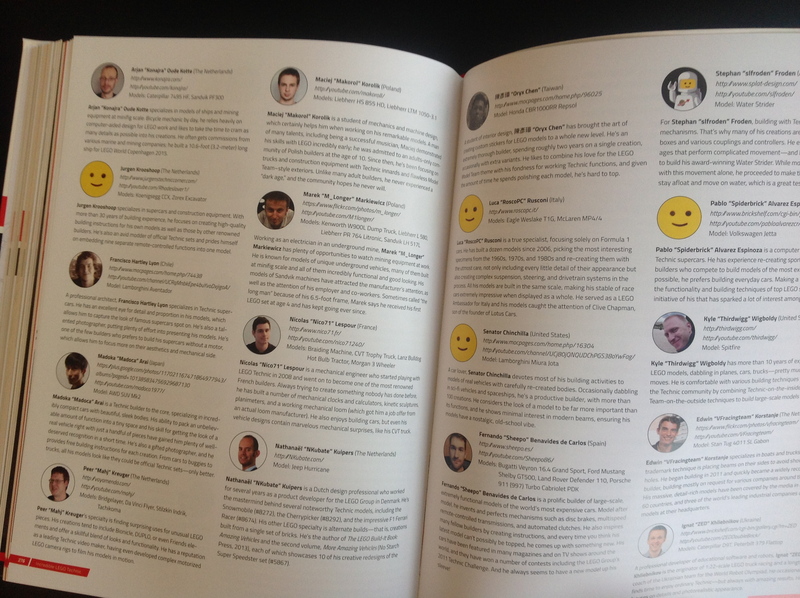 At the end of the book, all the builders are listed with biographies, and a small picture of the person (some get only a smiley face…boo). The final page of the book gives websites for each of the MOCs, including video and instruction information if applicable. It’s a nice feature, and having them all at the end keeps the chapters clean and absent of a whole bunch of URLs. 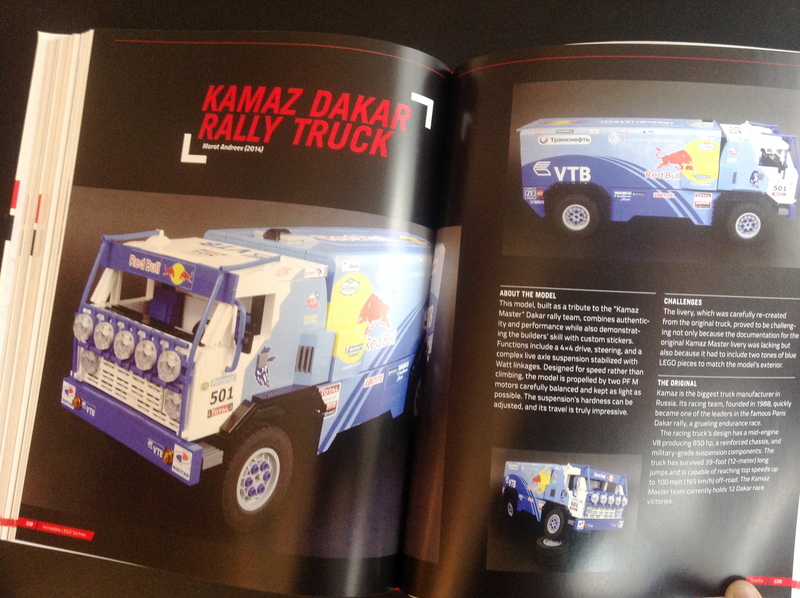 The book has a broad diversity of MOCs, builders, types of creations and time periods. The work of Blakbird is incredible, and is used to a stunning effect on many of the models. While I understand the work that goes into each of his renders, it would have been great to have them included for more of the MOCs. It’s clear the MOCs for which instructions are available, are the MOCs for which a technical render is given. As is expected, anything Sariel produces will have excellent photography. The presentation of the MOCs is truly stunning. All the photos are top notch and highlight the breathtaking MOCs. I found a couple of typos, but I guess you could find a couple at thirdwigg.com as well. I did not find them distracting, and most people will spend most of their time looking at the great pictures and stunning renders. The purpose of the book is to highlights many builders rather than the skills of Blakbird, but some of the technical renders could use a larger space. Additionally, there are some great small creations out there, and it would have been great to have more of them included. While I appreciate the diversity of the builds, it would be nice to have a couple more that are not replicas of something else. While the modeling on display in this book is great, the creativity that some express with LEGO without a template would be great to see. 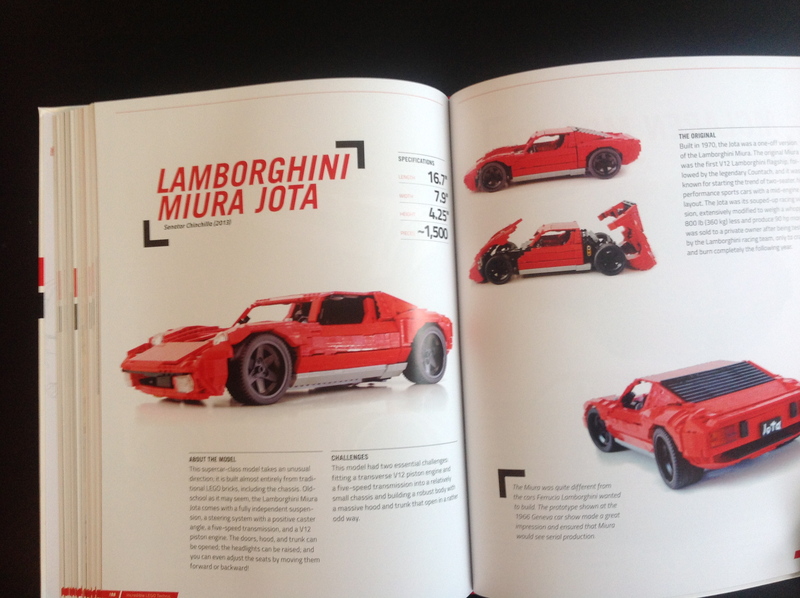 Looking through the final pages, it great see some of the greatest builders of the LEGO Technic community listed all together with pictures and biographies. I am honored to be among these builders. I hope you enjoy the book as I have. Pick one up; you’ll be glad you did. The Kenworth T55 is my favorite Trial Truck I have built. It’s not the best looking, or the most capable, or the most reliable, or even the most popular but it’s the one I keep coming back to. My latest truck is a continuation of the Kenworth series of trial trucks. The T55 would pull a stump, the T47 is quicker, has better steering, and more compliant suspension. Right from the beginning I knew the truck would have a similar cabin at the T55. 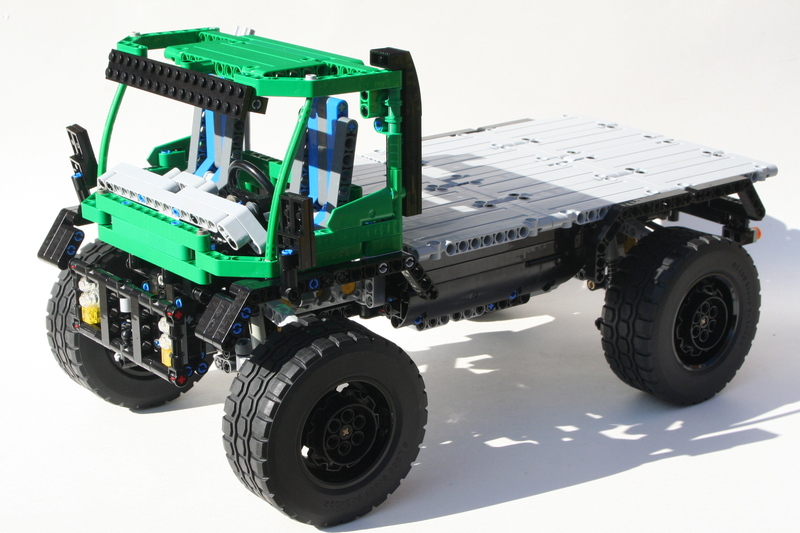 It would continue with the four wheel steering, and I added an independent suspension. The dimensions would stay close to the same. From there anything else was fair game. I started with the axles. The new suspensions arms made it a little bit easier to make a good independent design. 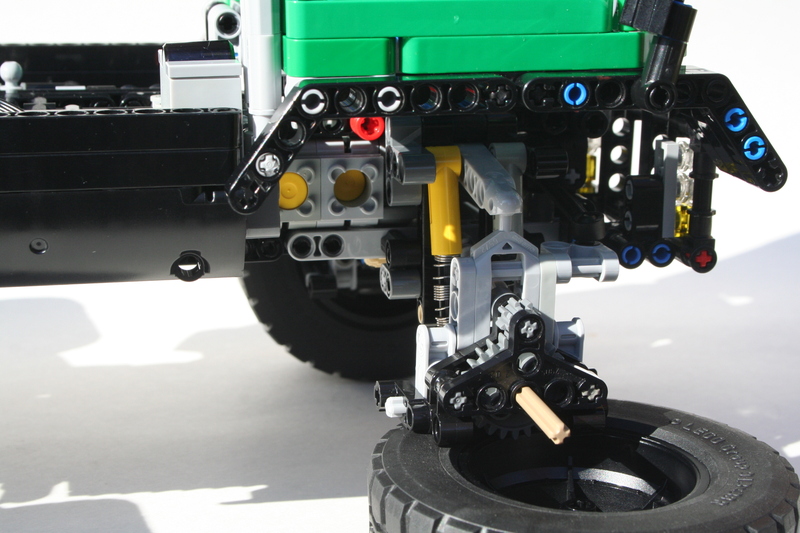 A CV joint was used at the steering knuckle, which allowed for the steering pivot to be near the wheel. Each wheel had about three studs of travel. The XL motor was placed on the left of the center line and the rechargeable battery box was placed on the right. A newly acquired Servo Motor was placed rear on the centerline directly in front of the rear axle. I had a little more space left, so I added a simple two speed gearbox. A little more space remained so I added a flat six engine. Part of my attraction of the T55 has been it’s coloring, and it’s shape. I wanted to keep the attraction similar, but in a way that would differentiate the trucks. I have been acquiring some green lately, so I thought would be a great color. The cab is basically the same, but now it can tilt so you can work on the engine. The off road performance was not great on the T55, and the T47 was similar. The independent suspension had too much play at the wheels to be great at steering, and the articulation was not very supple. The truck was great to drive around my house, but when I took it outside it did poorly. The suspension design is better than my last independent set up. There was no slipping of the gears. I think my next design will use the same knuckle, but design a different steering connection. This truck again proves the use of knob wheels rather than a differential for a trial truck. Feel free to make your own, and let me know what improvements you developed.